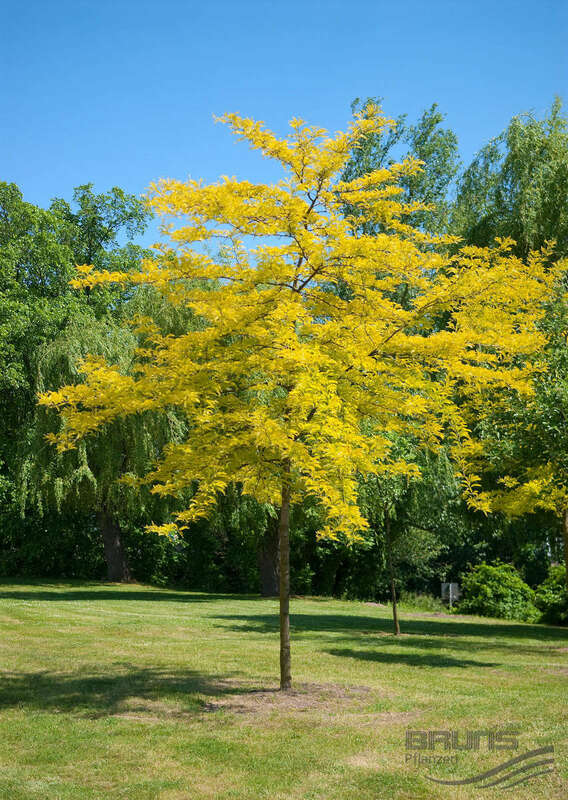 ​Key Features: Striking yellow foliage; thornless variety; tolerates wet and dry soils; provides a light canopy creating dappled shade beneath. Supplied: In a 3 litre container of peat-free compost, healthy and well established, approximately 40-60cm (2 feet) high, with full planting and aftercare instructions. Honey Lucust are striking trees and this handsome cultivar is no exception with its wonderful golden springtime foliage providing exceptional contrast against darker backgrounds. The leaves are fine and delicate in appearance and turn golden green as the summer progresses before returning to a buttery yellow come autumn. This honey locust is unarmed (its relatives have thorns just about everywhere but not this one). As the leaves are forming in spring, hazel like male catkins adorn the tree and are proceeded by clusters of small flowers during summer. The canopy itself is light and airy with arching branches casting only light shade and allowing for under planting. 'Sunburst' is a versatile tree capable of of growing in a wide range of soil conditions wet (not permanently) and dry. It is also useful as an urban tree as it deals well with air pollution and enjoys reflected heat from surrounding buildings. An excellent selection for any garden but essential if you desire a striking yellow foliage specimen. Full hardy.